Karen Cleveland with her son, Simon, in his nursery. The couple embrace a minimalist, Scandinavian aesthetic in the rest of their home, and the nursery’s no different. They bought the basic, larger items such as the crib, change table and floor lamp first. 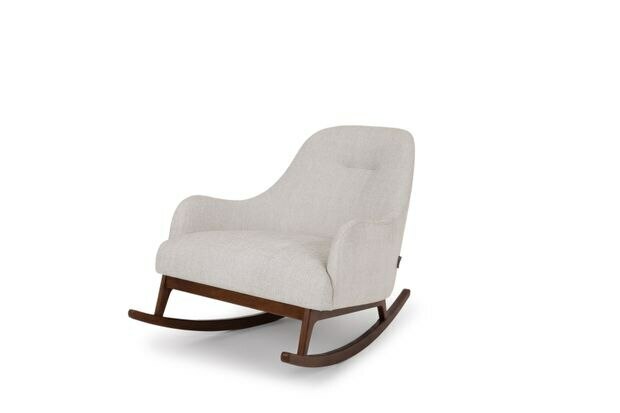 For these, they opted for wood and natural materials, found easily on Wayfair and favoured brand Babyletto. “We make design decisions really quickly, so we found and ordered [them] straight away,” Cleveland says. The rug, which creates a soft and calming gray-blue zone, was also a Wayfair purchase. “It takes some patience to sort through all the options, but we found it’s a goldmine,” Langer-Hack says of the online shop. The rocking chair, which Cleveland uses often, is from Article, another online seller. The couple is big on online purchases, especially for the small essentials and for the sake of convenience. “We have diapers on auto order,” Langer-Hack says. While the soothing back-and-forth of the rocking chair may remind them of ocean waves in distant climes, the couple chose to punctuate the space with mementoes and items that evidence their love of travel. A trip to Hawaii inspired the “Aloha” theme for the room, revealed through a pineapple paper mobile, retro travel posters and quirky prints by Hawaii-based artists Nick Kuchar and Kris Goto, and the “ceramic pineapple and quintessential Hawaiian dashboard doll,” Cleveland says. “We wanted it to feel kid appropriate, but not too juvenile or babyish. 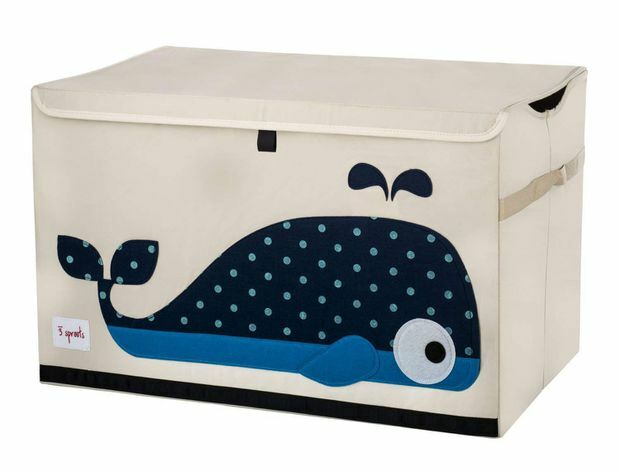 It’s the perfect amount of kitsch.” Even the whale-embellished toy chest from West Coast Kids and shark decals above the change table (which, due to their high-contrast, are a point of interest for Simon) are on-theme, though not island-specific. 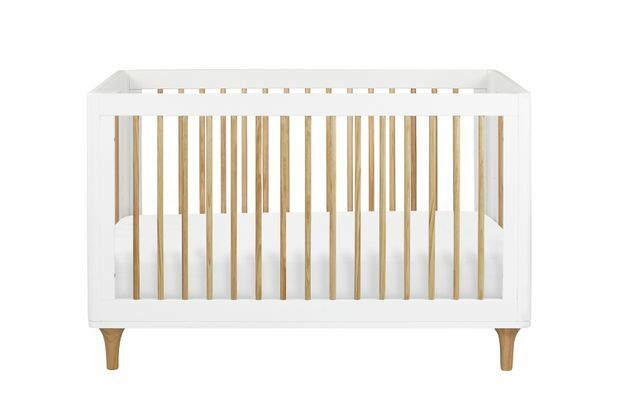 Lolly 3-in-1 convertible crib by babyletto, $569 at Wayfair. Embrace chair (coconut white and walnut), $899 at Article. 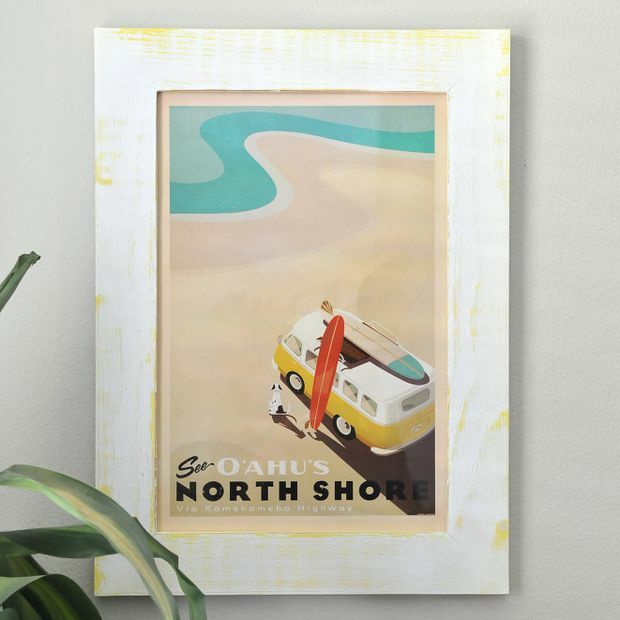 See Oahu’s North Shore Retro Hawaii travel print and frame, US$24 and US$90 at Nick Kuchar Art & Design Co..
Teterboro modern tripod floor lamp by Wade Logan, $375.99 at Wayfair. 3 Sprouts toy chest, $24.99 at West Coast Kids.